This development is subject to planning. The specification of our retirement apartments does vary to a degree with each apartment in every development, but this will give you an idea of what you'll find within a new two bedroom McCarthy & Stone apartment. This development is subject to planning. The Thatcham Retirement Living development is the perfect location for those wanting to settle down and be close to nature whilst enjoying the convenience and shops of the town. Situated in the heart of nature reserves and parks, this development resides in the charming town of Thatcham, just 14.4 miles from Reading and 15 miles from Basingstoke. With a wealth of choices for shopping, attractions and beautiful nature or historic walks, this development will provide retirees with everything needed to settle and start afresh. Offering a selection of stunning one and two-bedroom apartments, you can be sure that every one of our homes has been designed to offer the best in function, comfort and style. Apartments have been designed with stylish yet classic decor, so that your favourite pictures, trinkets and accessories will look great in your new home. You'll be pleasantly surprised to find luxury touches and practical appliances in each apartment too, designed to benefit your lifestyle. With its main frontage on The Moors Road, located on the edge of The Broadway retail core, this development is in a prime location with supermarkets and local shops, places to eat, banks, schools and fitness centres all within walking distance. In just 3 minutes, you can walk to a large Waitrose supermarket, ideal for weekly shops and fresh flowers or treats. In the same amount of time, you can enjoy a relaxed coffee at Costa Coffee or catch up on essential tasks at the Post Office or bank. Additionally, you can enjoy a range of delicacies and delights at the surrounding local cafes, shops and restaurants or head further afield to the charming pubs that reside in the surrounding countryside. 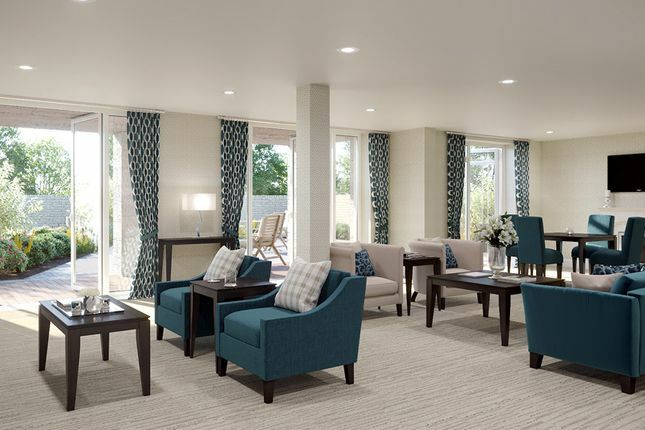 Residents at this property will benefit from McCarthy & Stone's intelligent and extensive security features, including a video entry system and 24/7 emergency call system. A dedicated House Manager will be on site to help you with any requirements, as well as provide residents with great services and activities. Selected apartments offer private balconies with lovely views of the town and surrounding area, and residents can also enjoy relaxed strolls in the communal courtyard and landscaped gardens. The McCarthy & Stone guest suite provides friends and family with a home away from home, so that they can join you for extended stays or overnight visits. You can also enjoy generous car parking, scooter storage and a cycle store on-site, giving you plenty of choice for transport. Steeped in nature and history, Thatcham is a market town with roots that can be traced back to 8400 bc. An ideal balance between nature, history and shopping, it's an excellent home for anyone wanting to settle down and relax in their retirement, without feeling too rural. This development is surrounded by excellent attractions, walks and amenities with the Nature Discovery Centre being a gentle stroll away. The centre is located by Thatcham Lake, with plenty of activities for both children and adults to enjoy. Here, visitors can explore the local wildlife, woodland flora and fauna in a serene location. To the south of the McCarthy & Stone residential development, there are a number of rivers and lakes to explore as well as plenty of pleasant strolls and easy-to-access paths. Excellent golf courses can be found within a short driving distance and residents can also enjoy the attractions of neighbouring town Newbury, that include Shaw House and Newbury Racecourse. Travelling around Thatcham and further afield is ideal for both drivers and those who prefer public transport, with excellent road links and public transport close by to this development. Thatcham train station is a 20-minute walk, 4-minute drive or 10-minute bus journey from the development and offers direct services to Reading, Maidenhead and Slough in under an hour. Convenient connecting services make travelling further afield a breeze with regular journeys to Swindon, Bath and Andover available. The A339 and A34 are accessible through the neighbouring town Newbury, which also offers access to the M4. Shops, fitness centres, schools, cafes and medical centres are all located in Thatcham with the main retail hub, The Broadway, right on this development's doorstep. Here, residents will find both small and large supermarkets including a Co-Op and Waitrose, local butchers and charity shops. Barclays and Lloyds Bank are also close by, while a Lloyds Pharmacy, Royal Mail Post Office and a selection of boutiques are available to explore. You'll be spoilt for choice when it comes to eating out, with a range of cafes, restaurants, takeaways and pubs right on your doorstep in a variety of cuisines including British, Italian, Chinese and Indian. If you are using a Sat Nav system you may need the full address of this development. The postcode may be newly created by Royal Mail and may not be accurate for some months. Property descriptions and related information displayed on this page, with the exclusion of Running Costs data, are marketing materials provided by McCarthy & Stone - Thatcham RL, and do not constitute property particulars. Please contact McCarthy & Stone - Thatcham RL for full details and further information. The Running Costs data displayed on this page are provided by SmartNewHomes to give an indication of potential running costs based on various data sources. SmartNewHomes does not warrant or accept any responsibility for the accuracy or completeness of the property descriptions, related information or Running Costs data provided here.